Atlus is giving away free copies of Yggdra Union to gamers who preorder Knights in the Nightmare, the soon-to-be-released RPG for the PSP. Some preorder bonuses are better than others, but you won't find many that can top a two-for-one game deal. That's what Atlus is offering to anyone who lays down some advance coin for Knights in the Nightmare: A code for a free downloadable copy of Yggdra Union. The code will be included with launch copies of the game and, for a limited time, with digital purchases made through the PlayStation Network. 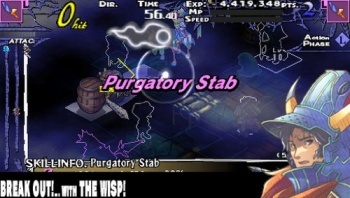 A "strategy-shooter RPG," Knights in the Nightmare was originally released in Japan in September 2008 on the Nintendo DS before hitting North American shores in June 2009. Yggdra Union started life as a Game Boy Advance title that came out all the way back in 2006 before getting a PSP overhaul for the Japanese market in January 2008. It arrived in North America in September that same year. Both games are part of the Dept. Heaven series of RPGs developed by Sting, which also includes Riviera: The Promised Land and two unreleased titles. Knights in the Nightmare comes out on the PSP in North America on November 9. For more information and preorder links, check out atlus.com.